I just had to create an simple vegan mayonnaise recipe seeing as mayonnaise is such a fantastically versatile sauce! 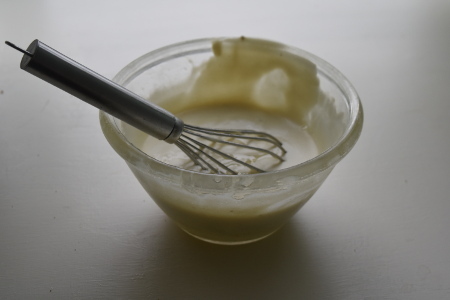 I’ve gone for basic, no fuss recipe that you can easily add to to create a more strongly flavoured mayonnaise (such as our Vegan Garlic Mayonnaise), or use as a base for other sauces (try the Best Burger Sauce or White Alabama Barbecue Sauce). Whatever you do with it, vegan mayo is an absolute must for a good vegan barbecue party. Vegan mayo tastes SO MUCH BETTER when it's homemade. I've tried countless supermarket imitations, but I generally find them too acidic and more like salad cream than a proper mayo. When you make your own, you have the absolute freedom to adjust the acidity and saltiness to your taste, and not to mention that it takes so little time and effort! After trying this recipe, I sincerely hope that you will never eat shop-bought vegan mayo again. We’ve decide to use aquafaba as an egg alternative in our recipe – this is the liquid you find in tins of cooked beans. As far as I'm concerned, it works so much better than using soy milk due to the lightness and fluffiness it adds to the mayonnaise. The joy of this being vegan is that aquafaba doesn't split from the oil as easily as eggs do - despite never making it myself, I've heard that making egg mayonnaise is a fine art...with my limited manual dexterity, even I managed to make a successful vegan mayo first time around! Makes around 125ml of mayonnaise (½ cup). Total prep time: around ten minutes. Bit by bit, as the food processor is running, add 120ml (½ cup) of the vegetable oil. Make sure that you add the vegetable oil slowly, allowing it to form an emulsion with the aquafaba mixture. Add the oil too quickly, and the mixture will split! And that's it! So easy, right? We don't call it simple vegan mayonnaise for nothing. Enjoy! Want to learn more about aquafaba? I'm no expert on aquafaba, but luckily it has its own official website! Click here to learn more about the history, science and nutrition of aquafaba!